Mystery Lovers' Kitchen: Friends, fun and food … isn’t that what it’s all about? Friends, fun and food … isn’t that what it’s all about? We use food for so many purposes: from seduction to staying alive, plus, of course, the delicious hit that the right dessert shoots straight into our pleasure centers. But I want to talk about one of the most important rituals for anyone who cooks: that is, celebrating friends and celebrating with friends. This year I found myself in Florida on (wait for it!) Valentine’s Day! That’s right. My DH was at home, no doubt serenading the Princess Dachshunds while I enjoyed a writing week in Fort Myers with three of my closest friends who also happen to be mystery authors. Along with Joan Boswell in her lovely home, Sue Pike, Linda Wiken and I worked hard on our projects and we laughed hard. Then we shopped hard. We also had a lot of fun in the kitchen. We enjoy each other’s company and we love cooking together and don’t even mind cleaning up as a crew. That’s a great combo. For our romantic dinner for four ladies on February 14th, I made my favorite party salmon dish. This is fast, easy, elegant and I always get asked for the recipe. Oh yes, and it looks good too. Like everything I make, you don’t have to be too precise. Combine the soy, ginger, garlic and sesame oil in a bowl. Place salmon fillets in baking dish or deep plate and spread with marinade from bowl. Marinate for 20 minutes. You can also put marinade and salmon in a freezer bag and marinate longer in the fridge. Your choice. Transfer to a cookie or baking sheet lined with aluminum foil. Bake at 425 for 20 minutes. Serve. If you’re feeling all fancy, garnish with lime wedges. I forgot this part. I did remember to prepare asparagus slathered with olive oil and sea salt (and baked at the same time and temp as the salmon). The team made wonderful basmati rice and a lovely crisp salad. This recipe serves four really good friends. Of course, you can double the recipe to serve eight friends or make half for two. If you are doing it for one, make two and eat the second one the next day. You deserve it. 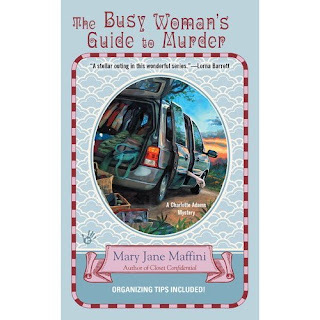 Mary Jane Maffini likes easy recipes because she has a lot to do and not much time to do it. Charlotte Adams, her organizer sleuth, has to manage her time too or things can get very dangerous, as you will see in The Busy Woman’s Guide to Murder (coming April 5th). Even Charlotte could make this dish. Visit Mary Jane at www.maryjanemaffini.com and sign up for her newsletter for book news, contests recipes and other fun stuff. I love that you took a girls' trip and wrote and cooked and shopped. How perfect. The dish sounds delish! And Busy Women need simple things. Yes, Avery, and busy women are always hungry! How wonderful, MJ! I love this story. There's nothing better than sharing good food with great friends. Thanks for sharing! Have a wonderful weekend!! You too, Julie! I hope yours will also have food, fun and family and friends. I bet it will! I absolutely love my asparagus roasted as you've described. I never make it any other way now. Can't wait to try your salmon. What a great picture of y'all! And I like recipes where you don't have to be too precise, too. :) Love the Princess Dachshunds! Thank you, Krista. If I had a home in Florida, you'd have an open invitation! Elizabeth, the Princess Dachshunds appreciate that! I am never too precise. Glad you like that too. MJ I always love seeing pictures of you little dogs. They are always so cute. I am glad I have not gone to the store yet. The recipe looks great. Thank you for sharing the recipe and the lovely pictures. Balmy day here in the Big Kumquat, almost like spring, not quite Florida, but, hey, good enough to start thinking about light, delicious seafood dinners like this one. Love the ginger and soy, sesame oil and garlic -- oh, yes, I am on board with this as a must-make. Your trip to visit, shop, and write with fellow authors-in-arms sounded wonderful, but please tell me you did not leave your husband to kiss dogs on Valentine's Day (even though they are quite attractive). I hope it turns out for you, Babs! Glad we caught you before the store. Alas, Cleo, we did celebrate Valentine's Day on Feb 16th this year - we are nothing if not flexible. I'll tell the DH what you said though. Joan, we look forward to our visit every year! And always come back with tips, some of which will show up on MLK in the next little while. I can attest to just how delicious this recipe is...and nothing can beat long-time friendships. We've been through alot together and always look forward to our Florida trips. Shared recipes (and movie and book lists) are always part of the pleasure. Plus the shopping! Everyone must try this recipe!